Stainless Steel Key Chain 4 long. Stainless Steel Key Chain, SSKC01, .092" (2.3 mm) ball diameter. 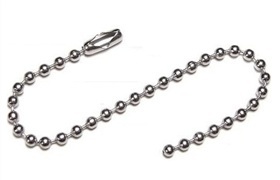 is standard ball chain used as a key chain. Please choose required length: 4" (10 cm) or 6" (15 cm).